Christmas is a time for wrapping up warm and enjoying being inside but wouldn’t it be extra special knowing your family, friends or even yourself have something great to look forward to in the summer? If you are still looking for those special, unique gifts this Christmas then we have the answer… Poole Windsurfing Gift Vouchers are available for all our lessons or equipment rental & will be a really different present to give! For a limited time we even have a 2 for 1 Christmas special offer on our Full Beginners Windsurfing Course – that’s right one person gets the 2 day course completely free! 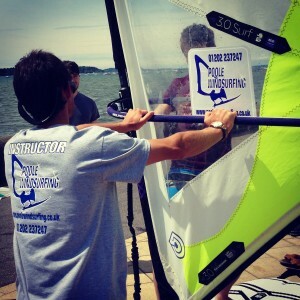 Check out the video below to see people enjoying this great windsurf course! Whether you are giving windsurf gift vouchers as presents to people you know or just treating yourself, it is definitely something to really look forward to come next spring, once the weather starts to warm up. All you need to do to solve your Christmas present shopping is give us a call on 01202 237247 and purchase your gift vouchers then we send them straight to you in a matter of minutes! If you can’t give us a call then you can also purchase direct from the website, just choose your Poole Windsurfing Gift Vouchers and add them to your shopping cart! Don’t forget we have an amazing 2 for 1 offer on our Full Beginners Windsurfing Lessons, which is a great way to get you & a friend out there learning how to windsurf and making the most of the summer months! Beginners windsurfing & advanced windsurfing training in Egypt!